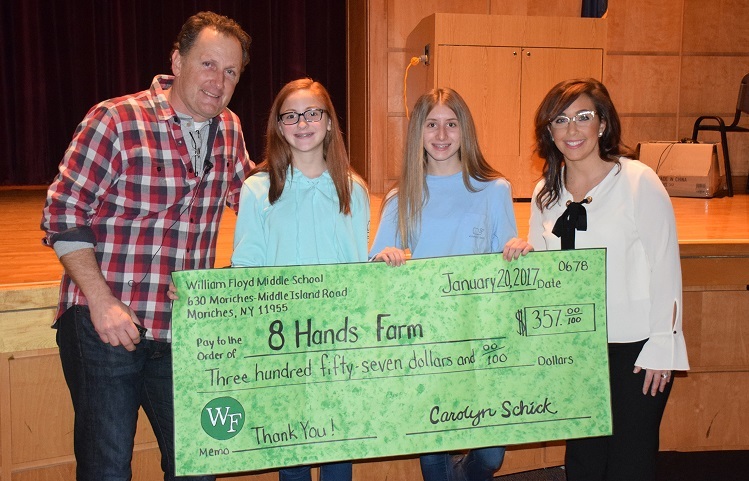 Moriches, NY - January 30, 2017 - Recently, eighth graders at William Floyd Middle School welcomed Tom Geppel, the proprietor of “8 Hands Farm,” a 28-acre sustainable family-owned farm in Cutchogue, NY, that employs organic practices in vegetable and herb gardens, as well as livestock raised on pasture. The visit, spearheaded by English teacher, Candice Carr, was in direct correlation to the book that students read, The Omnivore’s Dilemma by Michael Pollan, which examines the food choices and ensuing consequences consumers face in the age of industrial agriculture. Mr. Geppel shared with students his story and how he came to be a farmer on Long Island’s North Fork after watching the documentary, “Food Inc.” “It’s hard to believe that a documentary could trigger a life change, but that is exactly what happened,” said Mr. Geppel. “We learned much about the industrialized food system we didn’t know and didn’t like,” referencing the large-scale animal confinement operations that dominate the food industry today, and how his family’s philosophy is to operate an organic farm. Ms. Carr added that the students reflected on Mr. Geppel’s presentation and felt that he was passionate about making positive change in the world. They also expressed how it was wonderful to connect their learning to real-world experiences. Students are hopeful that they will be able to take a field trip to visit the farm in the near future. As a special thanks to Mr. Geppel for his visit, which was at no cost to the school, eighth graders raised $357 for his farm, which they presented to him in an oversized check.